_MAL7876, originally uploaded by Michael A. Lowry. This afternoon I stocked up on climbing gear and camping equipment at the local Eastern Mountain Sports store. I got some Black Diamond cams and nuts at 15% off, two Nokian studded tires at 25% off, and a North Face sleeping bag at 50% off! Not bad, eh? I also swung by the Bike Zone shop in Hyannis to see if they'd been able to obtain a replacement for the defective Specialized “Deviant” full-face helmet I had left with them. To my disappointment, they hadn't succeeded in getting a new helmet. I might try to see if I can find a replacement helmet at a big bike shop in Boston before I catch my flight on Thursday. In the late afternoon I took the kayak downriver to the sea. I had fun negotiating the swells and waves and made my way around the jetty, and up to the beach. After taking a quick swim in the surf, I sat in the sun for a couple of hours reading the copy of Tom Clancy's Rainbow Six that I picked up for 50 cents at the flea market a few days ago. I've found the people here on Cape Cod very friendly. 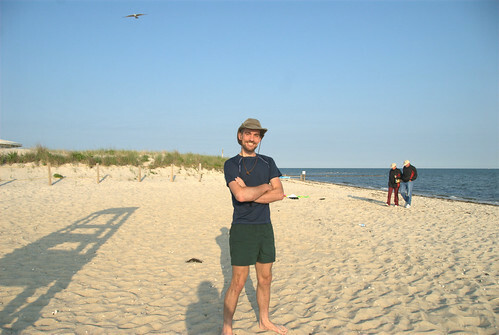 I chatted with several people on the beach, including a couple of cute girls visiting from elsewhere in Massachusetts. One of them took this nice photo of me. Thanks girls! Tomorrow will be my last full day here on the cape. I'll probably spend at least some of the day out kayaking and enjoying the sunshine. Of course I'll also need to start packing for my return to Stockholm. With all the gifts and goodies I've picked up, getting everything into one bag might be a challenge. Thursday sometime during the day we'll pack up and drive into Boston. We might do a little sight-seeing and shopping, and have dinner in the city. My flight leaves late in the evening, and I'll arrive back in Stockholm late Friday morning. I've enjoyed my first visit to Massachusetts and lookforward to visiting the Commonwealth again soon.